Here’s a place for the adventurous types to learn exactly what we offer, by the numbers. – Two 27-hole golf courses. – 22 neighborhood recreation centers. – 45 miles of snowmobile trails. – 44 kilometers of cross-country ski trails. – 8 self-guided hiking trails. Hartley Park is 975 acres; Barton Peak Forest Park is 2,775 acres. By comparison, New York’s Central Park is just 860 acres. Rockclimbing opportunities throughout the city. Park Point beach is the world’s longest natural sand bar, jutting seven miles into Lake Superior. Rated by Golf Digest (July ’98) as first in the nation for quality and accessibility in public golf. Recognized by the Audubon Society, Hawk Ridge acts as a funnelÂ for tens of thousands of migratory hawks, eagles and other birds of prey. 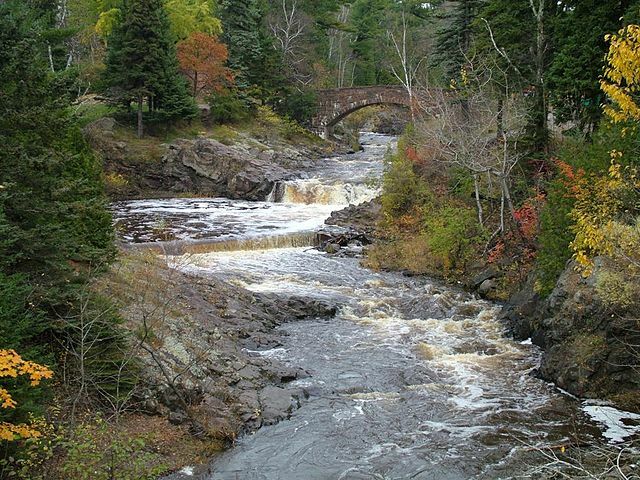 Gateway to Lake Superior’s scenic north shore. – 2.5-hour drive to the Canadian border. – Gooseberry Falls State Park. – Largest open-pit mine in the world. – Supplied the iron that built the nation. – Thousands of acres of untouched wilderness. – Much of the area is accessible only by canoe and portage. “State of the Air 2002” report places Duluth among the top 10 metropolitan areas in the United States with the least smog pollution according to data released by the American Lung Association from EPA Air Quality Index research. Just how much is a quadrillion, anyway? 350 miles east to west, 160 miles north to south. 3 quadrillion gallons, or 2,900 cubic miles, of water. Elevation: 600 feet above sea level; not to exceed 602 feet, as ordered by the International Join Commission. Large enough to dramatically affect weather patterns in surrounding areas; in Duluth, that means warmer winters and cooler summers. Final resting place for over 350 shipwrecks, including the famous Edmund Fitzgerald. Shoreline length, including islands: 2,726 miles. Empties into Lake Huron via the St. Mary’s River. Is large enough to contain all the other Great Lakes, plus three additional lakes the size of Lake Erie. Water flows into the lake from a drainage basin area of 49,300 square miles. It would take 191 years for the rivers in the drainage basin to refill the lake. Known for its clear, cold water and agate beaches. Could cover all of North America in water three feet deep. Seasonal storms can lead to waves over 20 feet high. 4,200 hotel rooms in the city. Home of the hotdish-Minnesota’s traditional fare! – 1857 brewery filled with specialty shops. – 100 shops connected by skywalk. – Fine apparel, jewelry, quality toys and gift shops. – Regional art, outdoor clothing & gear, books, toys, gourmet cooking items, candy, antiques, etc.